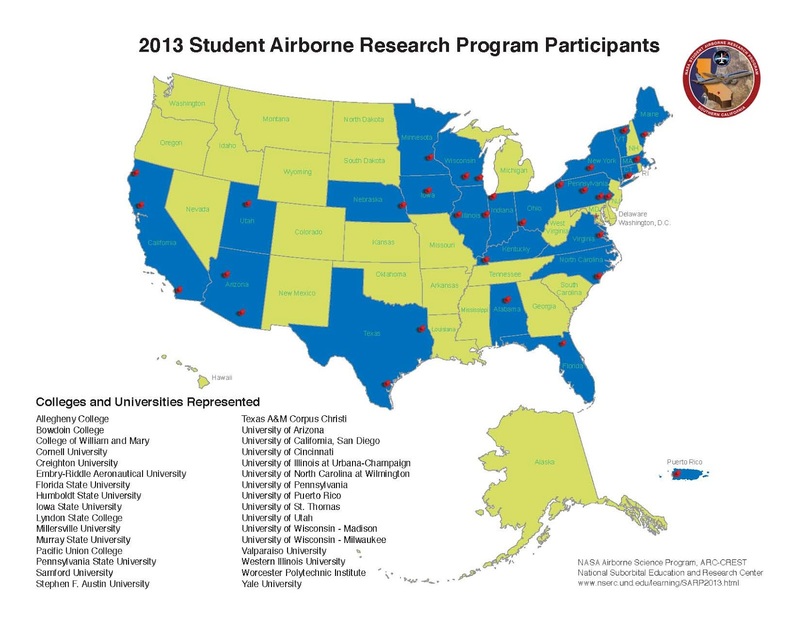 OnSunday June 9, thirty-two undergraduate students from across the United States willarrive in California for the fifth annual Student Airborne Research Program(SARP). The thirty-two students hail from thirty-two colleges and universities in twenty-two states andPuerto Rico. The majors of the students in thisinterdisciplinary group cover a wide range of scientific, mathematical, andengineering disciplines. Students were competitively selected based ontheir outstanding academic performance, future career plans, ability to work inteams, and interest in Earth system science. One of the great strengthsof SARP is that students from different disciplines learn from each other andwork together toward common research goals. Students also form lastingpersonal and professional relationships that they will carry into their futurecareers. 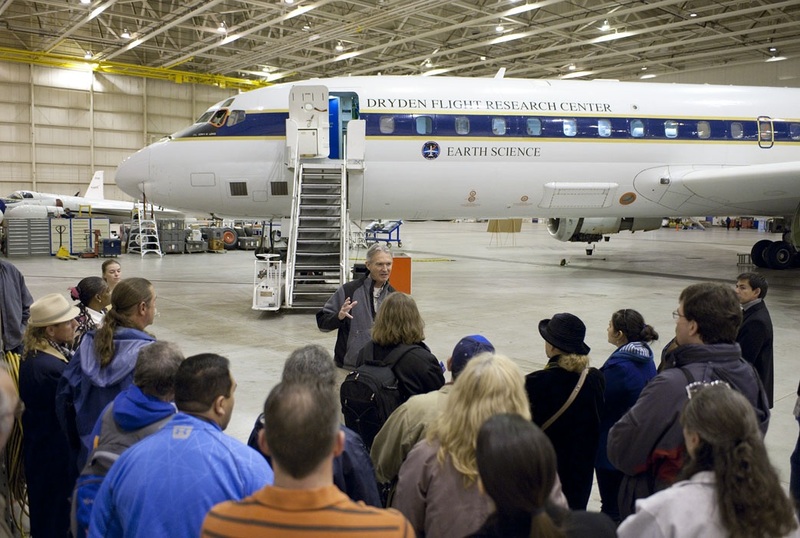 Thefirst two weeks of the program will take place at the Dryden Aircraft OperationsFacility (DAOF), where students will be introduced to NASA’s Earth Scienceresearch programs by NASA scientists, engineers, and program managers and by universityfaculty members. 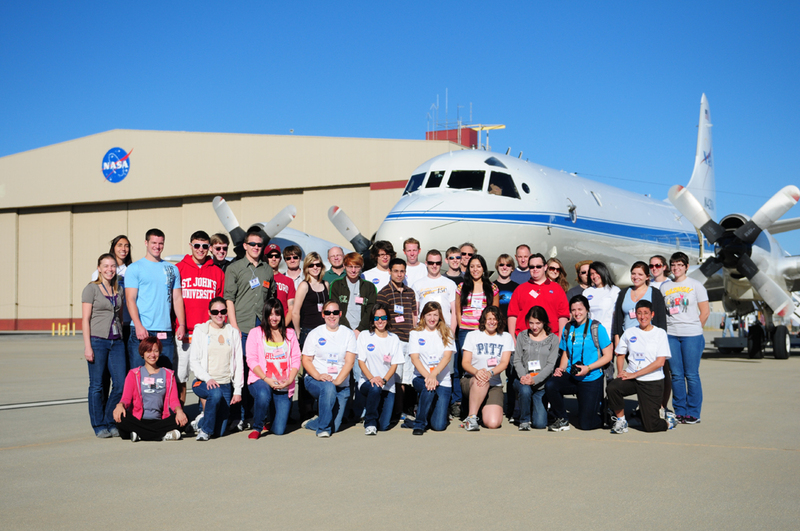 Students will then flyonboard NASA’s DC-8 airborne laboratory where they will measure pollution andair-quality in the Los Angeles basin and in California’s Central Valley, anduse remote sensing instruments to study forest ecology in the Sierra NevadaMountains and ocean biology along the California coast. In addition to airbornedata collection, students will take measurements at field sites. Thefinal six weeks of the program will take place at the University of California,Irvine where students will analyze and interpret the data they collectedonboard the aircraft. At the conclusionof the program, each student will deliver a final presentation on his/herresults and conclusions. Many studentsin the past have gone on to present their research at conferences such as theAmerican Geophysical Union Fall Meeting in San Francisco. One hundred and sixty-four K-12 classrooms from across the UnitedStates and Chile with 3030 total students participated in online chats withAirborne Science Program mission personnel in the field during the 2012/2013school year. 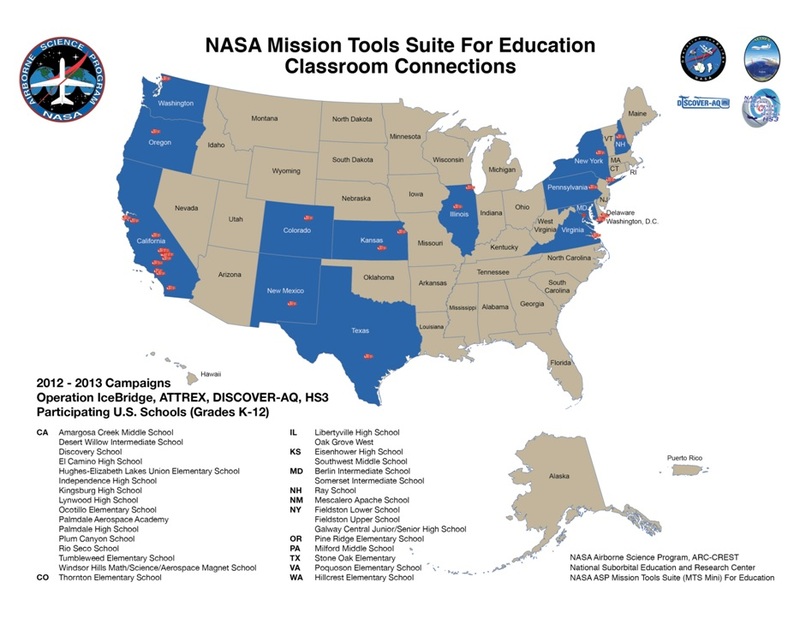 Mission Tools Suite for Education is a unique website that allows studentsand teachers to connect directly with ongoing Airborne Science researchcampaigns. 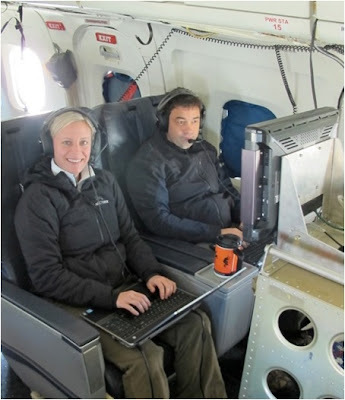 The Mission Tools Suite (MTS) is web-based software used bymission personnel to monitor and assist with real-time decision making duringthe course of an Airborne Science mission. The Airborne Science Programhas created a scaled down version of the tool called MTS for Education (MTSE),which is aimed at supporting core K-12 classroom science curriculum. From Kindergarteners asking if IceBridge personnel saw Santa when theyflew over the North Pole (they did not), to middle school students asking what itfeels like to fly a Global Hawk over a hurricane without actually being inside it during HS3, to highschool students asking specific questionsabout atmospheric chemistry during DISCOVER-AQ and ATTREX, classroom chats are effective at all grade levels. IceBridge Project Manager, Christy Hansen and Project Scientist, Michael Studinger onboard the DC-8 flying over Antarctica chatting with a middle school classroom in Maryland. Watch our educational video about the HS3 mission to seewhat MTSE looks like in action! 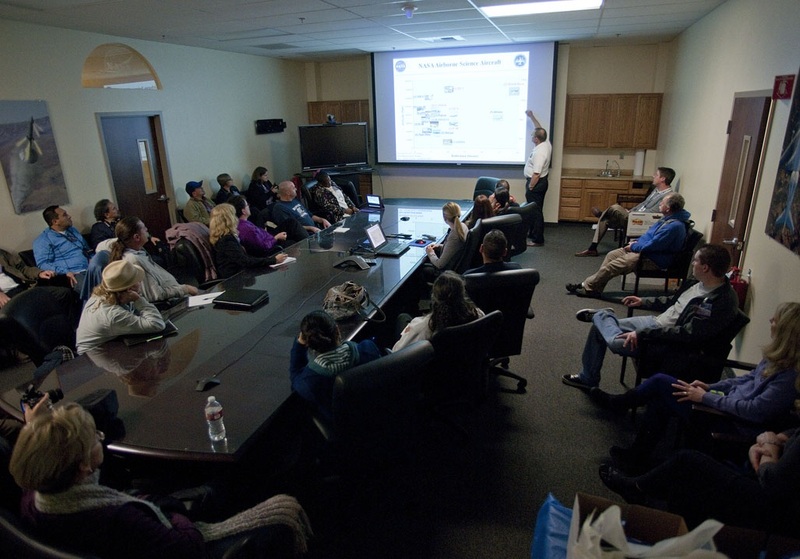 Twenty-seven elementary, middle, and high school teachers from Los Angeles and Kern counties visited the NASA Dryden Aircraft Operations Facility (DAOF) in Palmdale, California on Friday January 25, 2013. The visit coincided with the NASA Airborne Science Media Day. 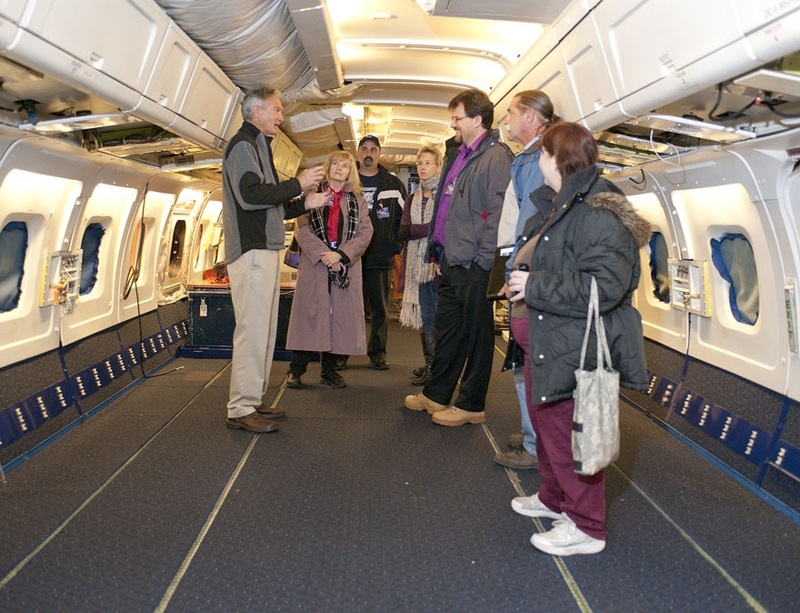 The K-12 teachers toured insides of the NASA DC-8 and P-3B Airborne Science laboratories. 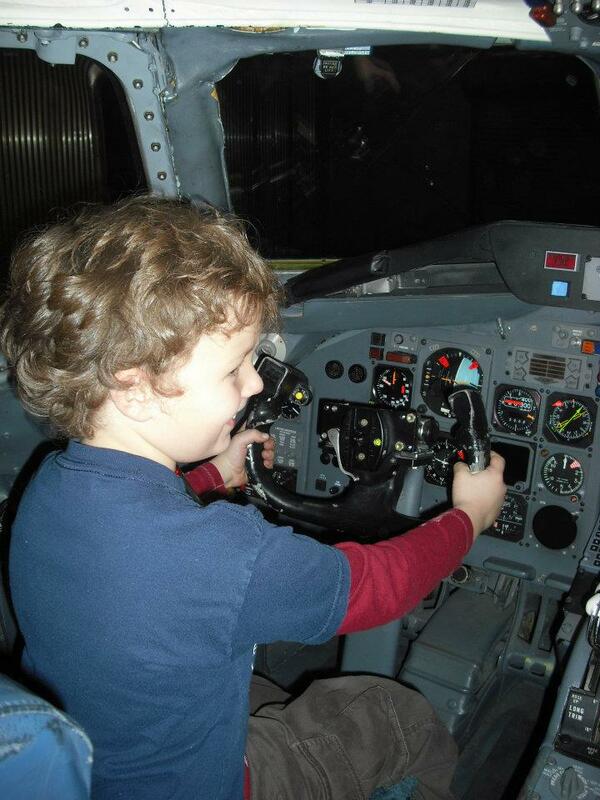 In addition, they saw and learned about the current missions of the NASA ER-2, G-III and B-200 aircraft. NASA Airborne Science Program deputy director, Randy Albertson, gave the teachers an overview of NASA’s fleet of airplanes and how NASA uses these planes to study the Earth and its atmosphere. 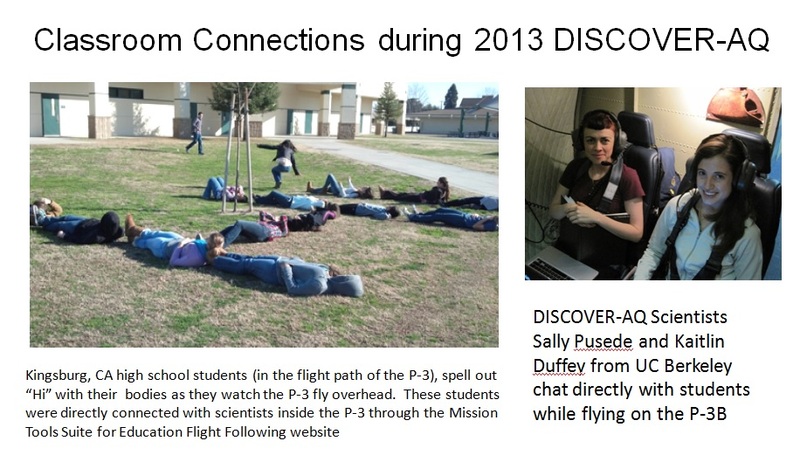 Teachers also learned about how they could follow Airborne Science flights and chat live with NASA scientists directly from their classrooms through a specialized website (contact emily.schaller@nasa.gov for more information). Finally, teachers also learned about teacher workshops and other opportunities available to them through the AERO Institute. The Hurricane and Severe Storm Sentinel, or HS3, mission will overflytropical storms and hurricanes using NASA’s Global Hawk UnmannedAircraft Systems (UAS) in the Northern Atlantic, Caribbean, and Gulf ofMexico. These flights will improve our understanding of the processesthat lead to the development of intense hurricanes. The mission willtake place for one-month periods during the 2012, 2013, and 2014Atlantic Basin hurricane seasons. 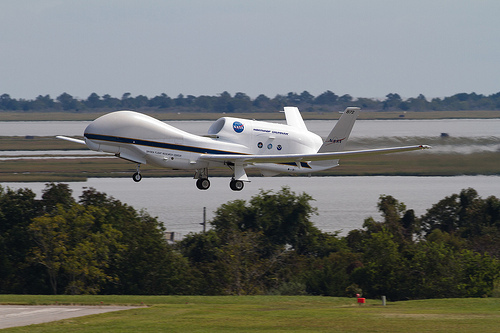 HS3 will use two of NASA’sGlobal Hawks, each equipped with state-of-the-art science instruments.One aircraft will monitor the environment around storms to look forconditions favorable for storm formation and intensification. The otheraircraft will repeatedly fly directly over storms to collect data on theinner-core structures that lead to storm intensity change. TheGlobal Hawk is a robotic plane that can fly to an altitude of 19.8 km(12.3 miles)—roughly twice as high as a commercial airliner—as far as20,278 km (12,600 miles), and for as long as 28 hours. The Global Hawksprovide a new and unique capability for collecting continuous,high-resolution measurements that will be crucial to understandingrapidly evolving processes in hurricanes. 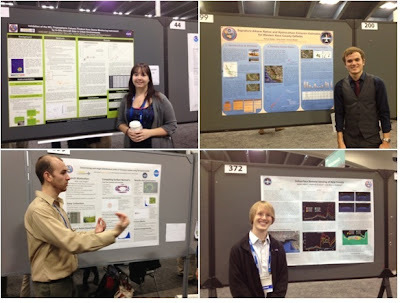 Eight NASA Student Airborne Research Program (SARP) 2012 participants presented talks or posters on their summer research at the American Geophysical Union (AGU) Fall Meeting in San Francisco, CA December 3-7, 2012. 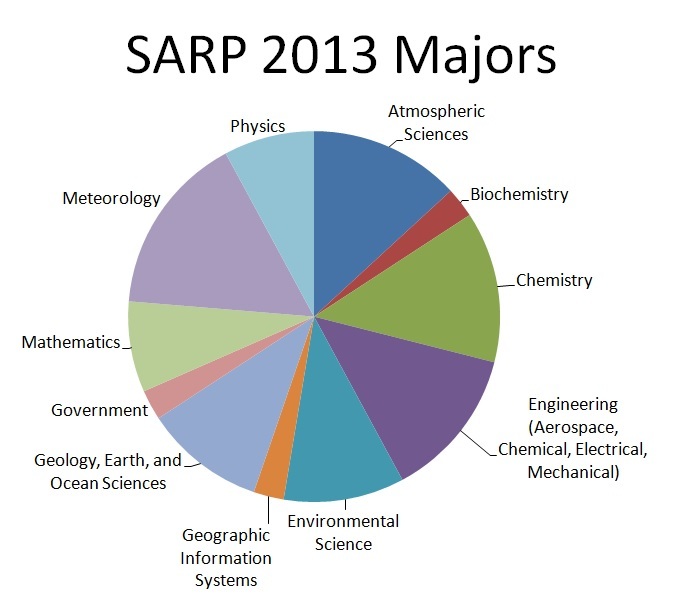 At the conclusion of SARP in August 2012, the eight students each submitted first-author abstracts to AGU with their faculty advisors and mentors as coauthors. 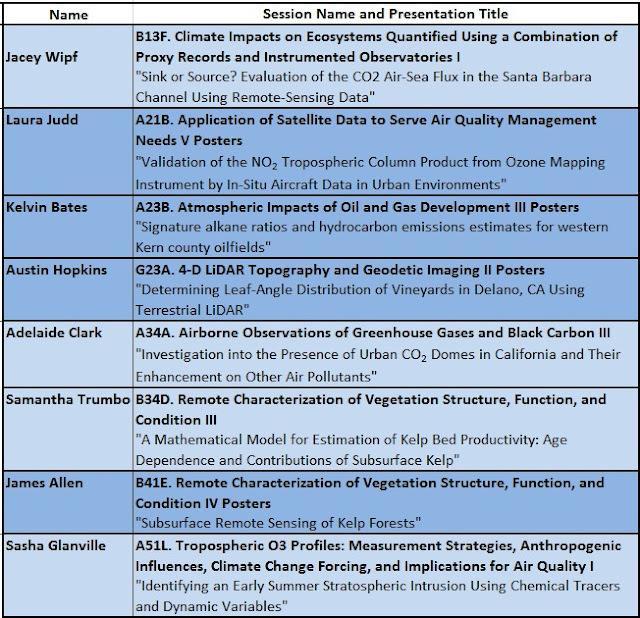 Students submitted abstracts to atmospheric science, biogeoscience, and geodesy sessions (listed below). In addition to the eight SARP 2012 students who presented their summer research, eight additional SARP alumni (2009-2012) also presented at the meeting. On Thursday December 6th, SARP alumni, mentors, faculty, staff, speakers, and NASA managers all gathered for a reunion dinner at Chevy’s Fresh Mexican Restaurant in San Francisco. The NASA booth at AGU was also the location for the debut of the 2012 SARP video. Applications are now being accepted for SARP 2013. Help spread the word about this amazing experience! 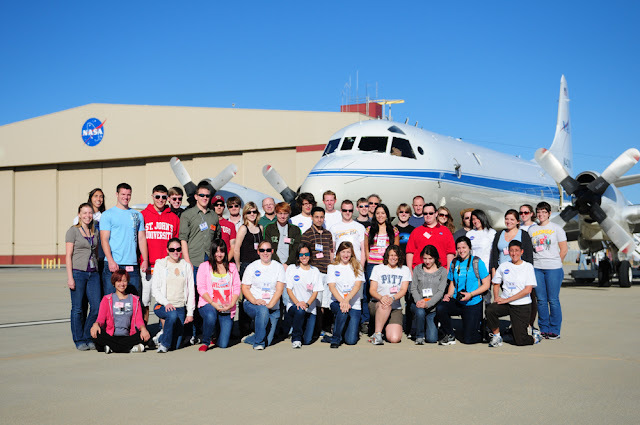 During NASA’s Hurricane and Severe Storm Sentinel (HS3) mission, students and teachers from across the United States learned about hurricanes and the NASA airplane that was studying them. HS3 is a five-year NASA mission to study hurricane formation and evolution with NASA’s Global Hawk Unmanned Aerial Vehicles (UAV). During the Global Hawk flights, students and teachers from across the United States were able to chat live with NASA scientists, weather forecasters, and pilots while tracking the position of the Global Hawk and the locations of hurricanes in real time. 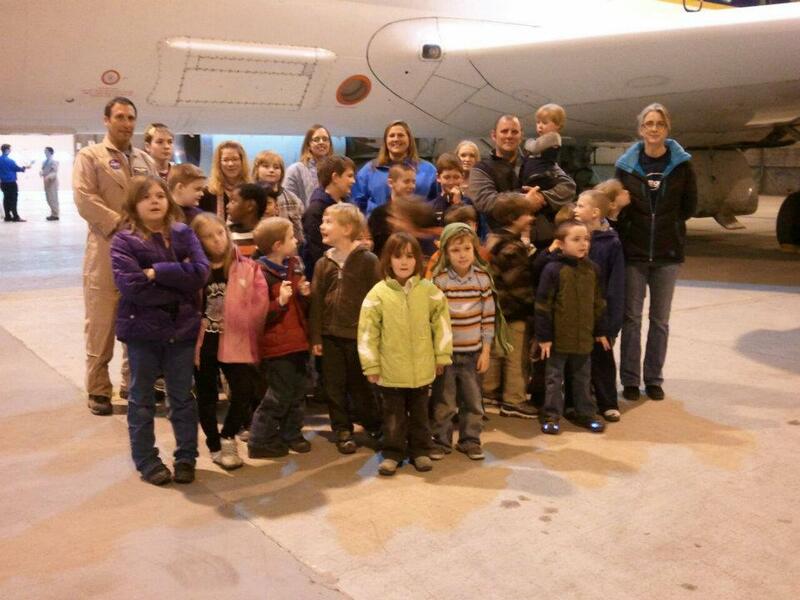 Students and teachers tracked the location of the Global Hawk and Atlantic hurricanes in real-time. 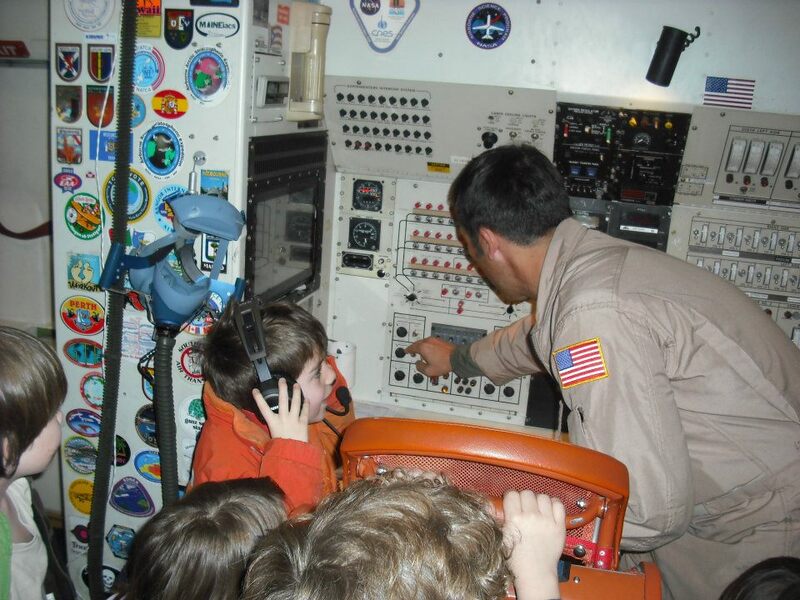 Though the HS3 mission has concluded for this year, many of these classrooms are continuing their involvement in Airborne Science Program missions. Next up is NASA’s Operation IceBridge. 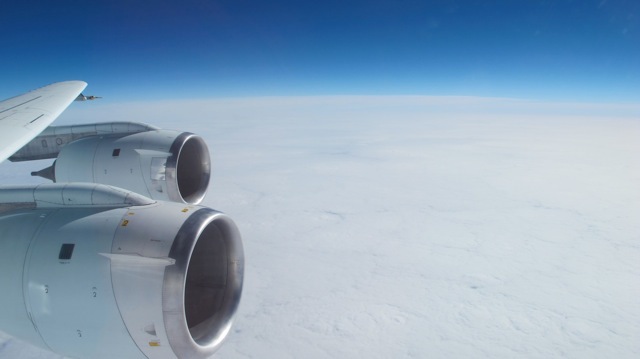 During IceBridge flights, students and teachers will be able to track the position of the DC-8 and chat live with scientists and crew who are actually onboard the DC-8 flying over Antarctica. 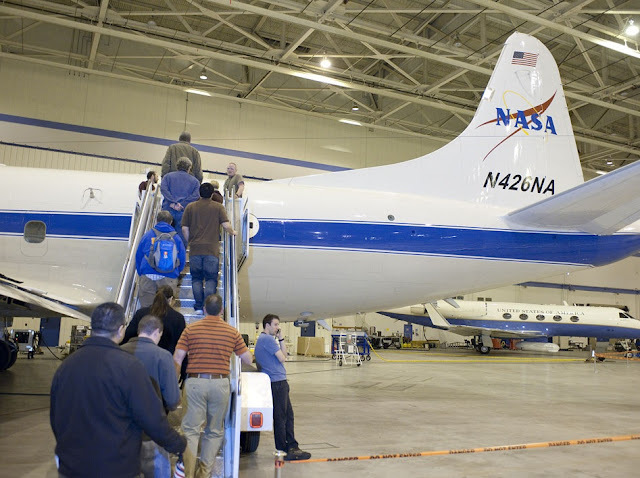 The NASA DC-8 aircraft recently completed a six-week study of snow and precipitation during NASA’s Global Precipitation Measurement Cold-season Precipitation Experiment, or GCPEx. During the GCPEx mission, the DC-8 airborne science laboratory was based at the Bangor International Airport in Bangor, ME and completed 13 data-collection flights over ground sites in Ontario, Canada. The goal of GCPEx was to tackle a difficult challenge facing the upcoming Gobal Precipitation Measurement (GPM) satellite mission — measuring snowfall from space. 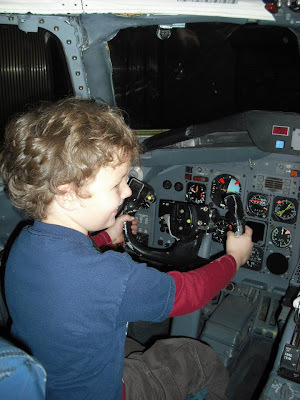 Before returning to its home base in Palmdale, CA, the DC-8 played host to a group of elementary school students from the Challenger Learning Center of Maine. These students were part of a February vacation camp designed to inspire them to pursue careers in math and science. Twenty-six student campers, along with ten challenger center staff and parents participated in the tour of the NASA DC-8. 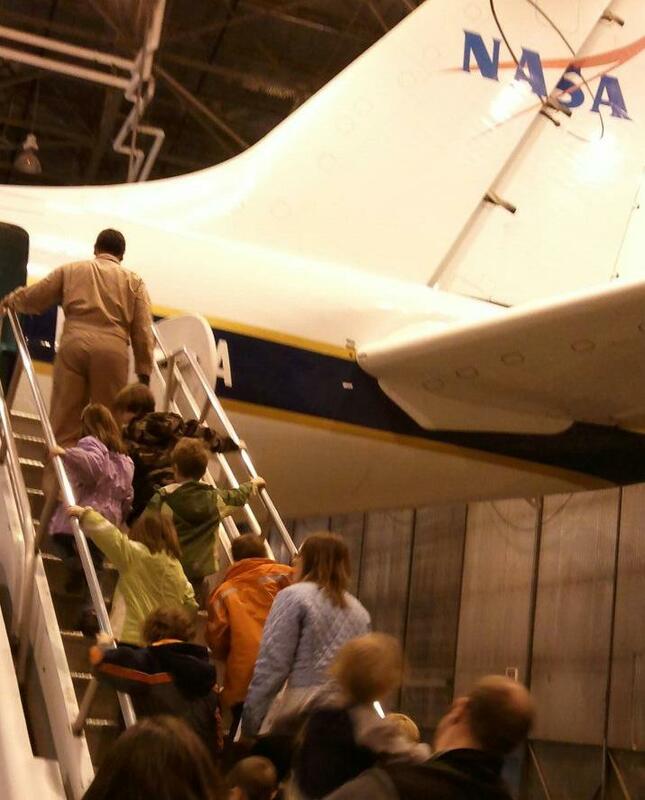 The group learned about NASA’s Earth and Airborne Science research, the GCPEx mission, and the DC-8 flying laboratory. They heard first-hand what an amazing experience it is for the scientists, engineers, and pilots to fly all over the world in NASA research aircraft. Six students from the 2011 NASA Student Airborne ResearchProgram (SARP) will present the results of their summer research at the 2011American Geophysical Union (AGU) Fall Meeting in San Francisco. Thespecial session for the SARP presentations will take place at in the Exhibit Hall at the NASA booth on Wednesday, December 7 from 11:30 AM-1:00 PM. Applications are now being accepted for SARP 2012. 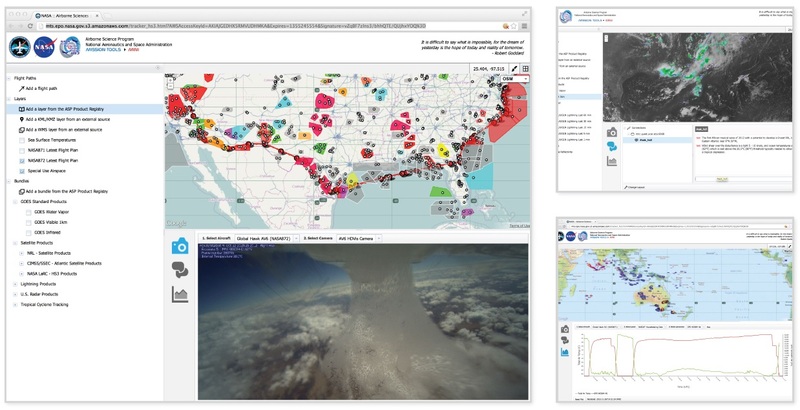 DISCOVER-AQ is a multi-year air quality research campaign that stands for Deriving Information on Surface conditions from Column and Vertically Resolved Observations Relevant to Air Quality. Two NASA research aircraft, the P-3B and UC-12, flew a series of profiles over six selected ground stations that monitor urban air quality in the Baltimore-Washington, DC area. Researchers chose the month of July to conduct the first DISCOVER-AQ mission, because that is when pollution peaks in the Baltimore-Washington area. The data collected from the aircraft and ground sites will be used to assess how satellites interpret air quality near Earth’s surface. Satellites have difficulty distinguishing between pollution that is high in the atmosphere and pollution at Earth’s surface. Future missions are planned in Houston, Sacramento, and the southeastern U.S. to compare the regional influences that drive air quality.